For those of you still longing for something as good as your Tootsie Roll Tootsie Pop, look no further. Lollyphile, a San Francisco-based company, has concocted sophisticated takes on your favorite childhood treat. It all started last Halloween when owner Jason Lewis, bereft of candy but with a surplus of the recently un-banned liqueur absinthe, whipped up a batch of absinthe lollies, which his friends scarfed down. Emboldened, he fidged and fudged until he came up with a USDA-approved treat that falls within the legal limits of the use of thujone, the supposed psychedelic that caused absinthe’s unfair banishment. The neon-green candy has a distinct anise flavor that any licorice lover will adore. Snack on it or use it as a curious end to a terribly decadent meal. Lewis began brainstorming, and several months later came up with another winner: Maple-Bacon. The candy, which is made with real maple syrup and studded with sustainably farmed bacon bits, is addictive. It had me craving a hunk of lip-smackingly good barbecue. 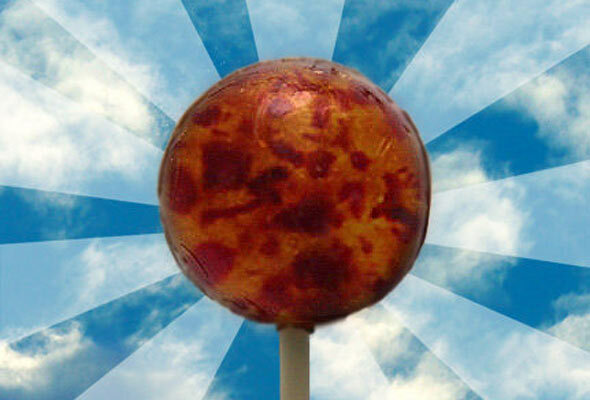 Right now you can purchase both the Absinthe and Maple-Bacon lollypops online. You can also find Lewis’s lollies at these retail locations. Thanks, I was just contemplating Bacon Chocolate Bars over at my blog, and this is definitely getting a link as well.